2 Bedroom Flat For Sale in Gloucestershire for Guide Price £410,000. A rare find! 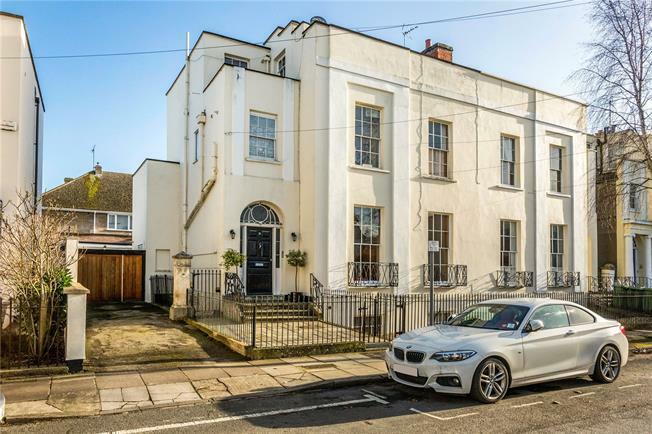 This super raised ground floor garden apartment forms part of a grade II listed villa just a short stroll from Cheltenham Town Centre and fashionable Montpellier. Cheltenham is a Regency town renowned for its fine architecture, national hunt racing, quality shopping and excellent schools. There are good sporting and leisure facilities including several gyms and leisure centres, swimming pools, tennis, squash, hockey and golf clubs. The apartment itself is accessed via a beautifully maintained communal entrance and offers well presented accommodation throughout. Period features can be seen including fireplace, sash windows, working shutters, high ceilings and decorative cornicing. A generous reception room which offers sitting/dining and views onto the garden leads through to a good size kitchen with modern fitted units and store cupboard. Exiting the kitchen there is a conservatory which lends itself to many uses and accesses directly to the garden. There are two bedrooms at the front of the apartment and a modern family bathroom with shower over bath. In bedroom two, a useful mezzanine area has been created for excellent storage which is vital in an apartment but not only that, could be used as a sleeping area or play area for children. The apartment benefits from a private south easterly facing lawned garden complete with terraced seating area to make the most of the sun. This apartment also owns a wide side access which provides parking for up to four cars and access to a small garage. To the rear of the garage is a home office with power, light & internet connection. Management Co: Applegain Property Management Ltd.
Service Charge: £100 per month.